David Scott Desmarais, 53, of East Granby, beloved husband of the late Brenda Desmarais, passed away on June 26, 2018 while tending to his beloved horse ‘Thunder’. Born in Springfield, MA on June 15, 1965; son of Roland and Sandra (Vrenna) Desmarais and he graduated from the East Granby Schools. David was an extremely handy guy and was always helping friends and family with mechanical tasks, fixing cars, and even with kind gesture of delivering a coffee. He enjoyed spending time with his dear family, Pomeranian Puppy ‘Tiffany Rose’ and a lifetime of taking care of his beloved horses. His kind spirit and warm loving heart will be truly missed by all people and animals who knew him. David is survived by his parents Roland and Sandra and a sister Francesca Ann Desmarais all of East Granby. Funeral Services will be private, and at the convenience of the family. 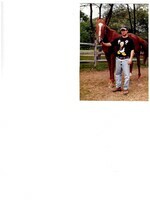 Memorial contributions may be made to the Second Chance Ranch Horse Rescue (East Granby Location) http://scrrescue.org/; Mailing Address: Second Chance Ranch: PO Box: 452; East Longmeadow, MA 01028. To send flowers to the family of David Scott Desmarais, please visit our Heartfelt Sympathies Store.